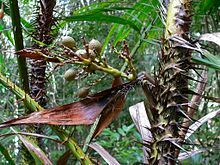 Any of several species of climbing palm of the genus Calamus. (uncountable) The plant used as a material for making furniture, baskets etc. (by extension) A cane made from this material. He who first acts as striker asks the other how many blows of the rattan he will bear on his forearm without crying out.